What Is Dayparting for Paid Search? And How Can You Use It? When it comes to running successful paid search campaigns, ensuring ads are shown only when you want them to is key, and dayparting is the way to do that. Through this article I will go over what dayparting is, how it can be beneficial to various industries, how to determine the best schedule for you, and finally, how to set up dayparting for your paid search campaigns. Dayparting in the simple sense is a schedule for your advertising. While I will be discussing dayparting and how it relates paid search, dayparting first played a role in traditional media with television and radio planning. When planning a TV or radio buy, media planners look at their target audience, their viewing/listening habits, and rating points to decide when to run a TV or radio spot. When running a paid search campaign, online marketers can and should examine their customer behavior, client operating hours, and budget to decide when their campaigns should run. How is it Beneficial for Various Industries? At the end of the day, the ad schedule you use for your campaign will be unique to your client. Below are a few examples across various industries to help spark some ideas around the type of dayparting you should implement. For a restaurant looking to increase foot traffic on certain days of the week, or even during certain lunch hours, an ad schedule for their campaign can be tailored around this. An example would be a local pizza restaurant that already gets enough natural traffic on Thursday nights and all-day Sunday during football season. To most efficiently use your budget, you’ll want to ensure your campaign is only spending during the times and days you want to increase foot traffic. You may also consider turning your campaigns off on Thursday nights and Sundays. In the home services industry (plumbing, electrical, pest control, etc. ), time is of the essence. Whether it’s the customers’ urgent need for service or it’s the client’s staffing availability to run or take calls, using dayparting for your home service paid search campaign is essential, especially if you’re working with a limited budget. If your client runs a local plumbing company that can’t answer phones on the weekend, excluding weekends from your ad schedule will allow for the budget to be split across five days instead of seven. If your client can answer the phones 24/7 but wants to stay below certain CPA thresholds, there can be potential to adjust your ad schedule around lower cost times, decreasing your bids during the more expensive hours and devoting more to the lower cost hours. In one of our recent case studies, A 360° Paid search Marketing Effort, we show how a local plumbing company can look at their ROI down to the hour to help determine the best ad schedule for them. If you’re running a campaign for an ecommerce site, you may find users doing most of their research in the evening after they’re home from work. To get the attention of these customers while they are researching, you’ll want to make sure your campaigns are well set for the evening hours, and maybe eliminate or decrease bids when customers aren’t expected to be researching as much. If you’re running a brand campaign for a brick and mortar store, you may want to run ads during the hours your stores are open, since users could be doing a search for your name, so they can find your address. For your product centered ads, like ecommerce searches, you may find success in pushing during the evening hours when traffic is higher and pulling back when demand decreases. For many B2B industries, mirroring an average work week schedule of 9-5, Monday-Friday could yield better conversion rates than outside of work hours. As previously mentioned, the ad schedule you use for your campaign will be unique to your client, so how you determine that ad schedule will be unique to your client as well. Below are a few resources you can look at to help you determine your ad schedule. One way to plan a dayparting schedule is to use your current website traffic to pinpoint when customers are coming to your site and when they are the most engaged. 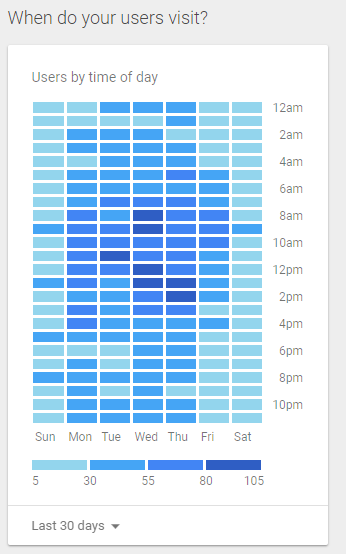 Using Google Analytics, you’ll be able to see what days and hours of the week users are coming to your site, allowing you to tailor your ad schedule to theirs. If you see a lot of users coming to your site during certain hours but are not really engaged or returning to the site, you may decide to bid back during those hours, so you’re not paying as much for clicks on your ads. If you want to keep it simple and look at just overall visitor traffic to your site, the Home page within Google Analytics will give you a snapshot of this. If you’ve been running your campaigns for a while, you can use your paid search data to optimize your ad schedule. Since dayparting is done on the campaign level within Google and Bing Ads, you’ll want to drill down into your data at the campaign level. If, for example, you find your positions drop in the evening hours when your customers get home from work and start doing their research, you can begin experimenting with bid adjustment increases during those hours to help increase your positions. You may find you’re paying more per click or acquisition during certain hours than you’d like, but with dayparting, you can decrease your bids during those times to help reign in those CPCs and lower your CPA. Another way to help pinpoint your dayparting schedule is based on your client’s business hours. If your main goal is phone calls but your client can’t answer phones during certain times, adjusting the ad schedule around theirs is best. If your client already has a sense of when they want business, work with them on getting that tightened up and test various ad schedules and bid strategies around it. Setting up your dayparting ad schedule is straightforward, whether you’re using Google Ads or Bing Ads. You can use the web interfaces or downloaded editors to do this. Here, I will walk through how to set it up using the web interface. 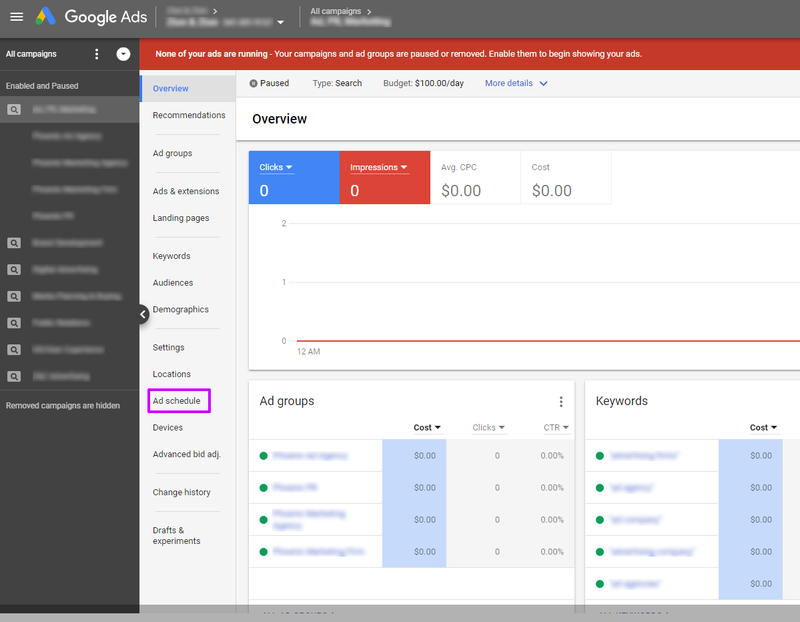 To setup and adjust your ad schedule within Google Ads, you’ll first go to the “Ad schedule” tab within a campaign. From here you’ll be able to add your ad schedule in two different areas. Next, you’ll setup your ad schedule. You’re able to schedule down to 15-minute increments, and have a few presets (All Days, Monday – Friday, and Saturday – Sunday) available to choose from if you want to keep the same schedule across multiple days. An optional step depending on your plan is adjusting the bid for your ad schedule. Like how bids are adjusted at the ad group or keyword level, you simply click and type in your bid adjustment for each campaign. Next, you’ll add your schedule, with the ability to schedule down to 15-minute increments. While adding the schedule, you’re also able to apply your desired bid adjustments. Now that you’ve added an ad schedule for your campaigns, it’s time to collect data and see how it performs. With ad schedules not being set in stone, you can adjust them as often as needed, testing different times to see what works best. An ad schedule that works for one month, may not work for the next month, so it’s always important to continue monitoring your campaigns down to the day and hour, and make changes as needed.